Wooly Mammoth became extinct by the last ice age 10,000 years ago. It is the most familiar relative of the modern elephant. Mammoth tusks are mostly found in Siberia, Russia. Considered precious because of its antiquity, artists such as Poleung Cheung, have chosen to work with it in place of the Elephant Ivory that is no longer legally allowed. 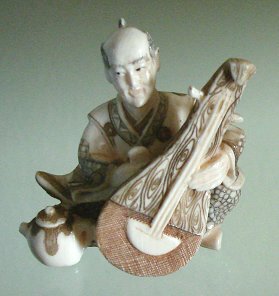 These tiny figurines, reminiscent of the Japanese Netsuke, are being made here in California, USA. Please scroll for more information. These carvings are intricate and fine in their execution, worthy of any collection. They measure about 1 1/2" to 2" high and may vary in detail as they are all hand carved sculptures.